…believed in ghosts and fairies? In fact, he was a member of Spiritualism or “Psychic religion”, and wrote extensively about it at the end of his life. He also traveled to America, Australia, Africa and Europe to talk about the occult. It was his psychic crusade. Sir Arthur Conan Doyle had a major role in making skiing a popular sport. He was friends with the magician Harry Houdini, but they had a falling out about Spiritualism and never spoke again. The author based the Sherlock Homes character on his mentor and university professor, Dr. Joseph Bell. 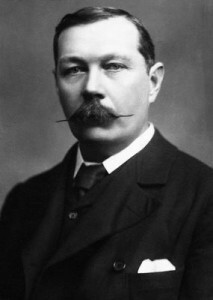 Sir Arthur Conan Doyle was a physician by trade, but he started writing when he was still attending medical school. At the University of Edinburgh, he met future writers James Barrie and Robert Louis Stevenson. The author was bullied in school when he was a child.